Elite Equine foundation formulas are the original super supplements and we are STILL the only company in NZ to offer you a FULL RANGE of organic proteinate minerals, the most stable and absorbable form, which eliminates imbalances due to different absorption rates PLUS probiotics and other functional nutrients to create the ultimate in nutritional support. We are 100% organic and we are the original. Our products form a system of nutrition starting with our mineral and foundation formulas. All our targeted solutions are designed to be fed with one of our foundation formulas, and products are interchangeable. We do this so there are no dangerous or costly double ups. Everything is designed to work with everything else. You will also find a solution to your issue without feeding 4 or 5 supplements! "Our promise to you is that our supplements will make a noticeable difference to your horse." *If you are unhappy with the performance of our supplements, we invite you to a free product consultation worth $100.00 to get the result you need! Recently there have been more and more attempts to imitate our ideas and formulas, in particular Compete. Similar names or an attempt emulate our formulas but with much lower grade ingredients, hoping to gain some advantage by associating with our ideas and brand. 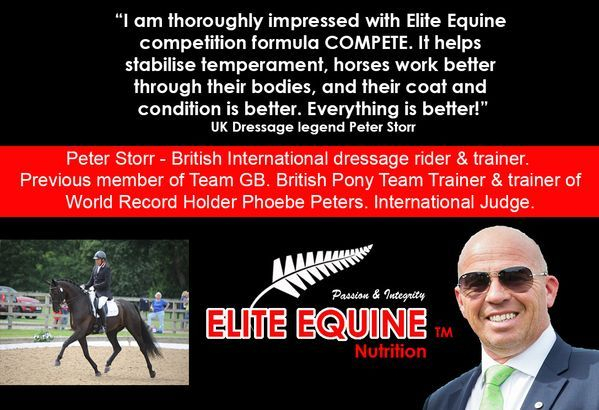 Elite Equine Formulas quite simply offer superior nutrition. There are no short cuts or cheap ingredients. Unlike those who claim to have the "highest spec" minerals supplements on the market using amino acid chelates, we actually do by going one better and using proteinate minerals which are chelates bound with protein not amino acids. For more chemistry information on what minerals are the best for your horse click THE SCIENCE on the menu and visit our page The Chemistry Of Organics. Compete and Compete SF and Mega Build offer a level protection against Laminitis, some forms of colic due to their exceptional support of the hind gut. Our products promote a prolonged productive life, enhanced performance, strength, immune response and recovery. Increased fertility and correct development and promote trouble free breeding cycles. Your horse will be significantly more likely stay sound and strong for longer, with less health challenges. Less vet bills, less feed and healthier horses - why wouldn't you? Mud fever and warts gone. Better condition & top line. Finer/darker coats that shed earlier. Now powered by Elite Equine! Stronger horses are faster horses!